Reminders of the American Civil War abound in the United States. Even regions far from the battlefield can point to local memorials and veterans graves as a reminder of those tumultuous times. In contrast, there is little on the island of Ireland to remind its citizens of the nearly 200,000 Irish involved in the war. This is not to say such reminders don’t exist. Some Irish veterans of the conflict did return to the country of their birth after the war. This is the first in a series of posts that will attempt to highlight these men, the majority of whom lie lost and forgotten in cemeteries around the country. It is difficult to find veterans of the American Civil War in Ireland. One tool is to examine the 1883 ‘List of Pensioners on the Roll’ which contains a section on those individuals claiming a United States pension in foreign countries. A total of 91 men are recorded as receiving a pension in Ireland for service in the United States forces. That number is increased when widows and dependants are included, and they will be the subject of later posts. Over the coming months a new resource section will be added to this site which will provide brief details on these men and women, in the hope of discovering and recording their final resting places in Ireland. 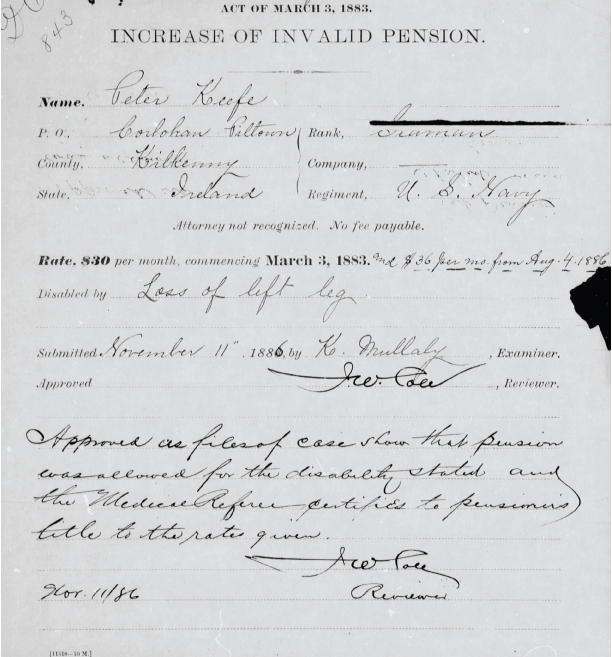 Not all of the men receiving a United States pension in 1883 had seen service in the American Civil War- some served afterwards, be it in the Navy or in the regular army. Despite this, the majority of the 91 men listed earned their pension for services between 1861 and 1865. 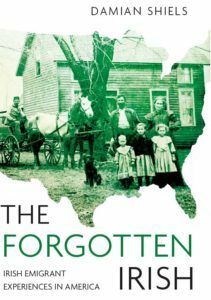 They most likely had varying reasons for returning home; perhaps some were disillusioned following the war, or found that their disabilities stifled their hopes for making their way in America. For many it may simply have been that they could now afford to go home, as they were in receipt of a pension that helped to support their journey. Below are short profiles of the first ten of these men examined. John Donnelly received a pension of $14 a month in 1883, which he collected at Armagh Post Office in Co. Armagh. This was for an unspecified disability which he had sustained as a result of service in the 3rd New York Cavalry. He was not a young man when he was enlisted in New York on 4th December 1863, being 37 years of age. Serving in Company F he was discharged on 15th June 1865 from Balfour General Hospital in Portsmouth, Virginia. During his service John would have seen service in the Eastern Theatre, notably around Petersburg. Private William Connor, 6th New York Heavy Artillery- Co. Cork? William Connor received a pension of $24 which the List of Pensioners states was collected in Ballyhoold Post Office. This may be Ballyhooly, in Co. Cork. The then 43 year old had enlisted at Cortland on 21st August 1862, as part of Company I (originally 135th Infantry) to serve for three years. The Irishman had experienced the horrors of the Overland Campaign in 1864 before he and his regiment arrived before Petersburg in June. On the 20th of that month Connor received a wound which necessitated the amputation of his left arm. He was discharged for disability on 11st September 1865 at De Camp General Hospital in New York. Archibald Wilson collected $17 per month from Belfast Post Office as a result of varicose veins in his left leg. As a 21-year-old he had enrolled on 16th May 1864 at Hart’s Island, mustering in as a First Lieutenant in Company K on 16th May 1864 for three years. His most notable service came with his regiment in the 1864 Shenandoah Valley Campaign. Archibald was promoted to Captain of Company F on 28th March 1865, mustering out on 27th June the same year. Peter Keefe went to his local Belline Post Office each month to receive a pension of $24. He had enlisted in New York on 12th October 1863, and on board the Perry he was part of the Federal blockade of southern ports. In late 1864 she was patrolling of Murrell’s Inlet in South Carolina, when a number of the crew were sent ashore to burn a Confederate schooner. Keefe was captured by the Rebels, and in attempting to escape was shot in the left leg. This resulted in the amputation of the limb above the knee. Peter was honorably discharged on 12th November 1864. Hugh O’Brien received $18 a month which he collected at Castlecaulfield Post Office in Co. Tyrone. As a 32-year-old he had enlisted in the 170th New York on 26th September 1862 in New York. Assigned to Company C, he fought with the Legion at Spotsylvania and Cold Harbor before receiving a sever wound during the 16th June assault on Petersburg. This necessitated the amputation of his left leg. He was still in hospital when his Company mustered out at the end of the war. Donaghmore Post Office was where Patrick Connolly went to claim his $18 a month. As a 22-year-old he had enlisted in Newark, New Jersey on 20th April 1861. He initially became a Private in Company K of the 70th New York, being promoted to Corporal on an unknown date. His served throughout the Peninsula Campaign of 1862 at battles such as Seven Pines, Savage Station and Malvern Hill, before he was wounded at Bristoe Station on 27th August, 1862. As a result of the wound his left foot was amputated. He was discharged for disability on 13th August, 1863. Private Owen Devine (also Divine), 37th New York Infantry ‘Irish Rifles’- Co. ? The List of Pensioners states that Owen Devine collected his $6 a month pension at ‘Dramscridian’ Post Office, an as yet unidentified location in Ireland. He had enlisted as a 40-year-old on 9th May 1861 at Ellicotsville for a period of two years. As a Private in Company I he was captured at the Battle of Chancellorsville on 3rd May 1863, being paroled ten days later. Owen was mustered out with his Company on 22nd June 1863 in New York; he would later develop varicose veins in his left leg as a memento of service. Thomas Beatty received $18 a month for the loss of his left leg, collecting his pension at Drogheda Post Office. His roster records are somewhat confused, but he may have served in the 6th New York Infantry in the early part of the war. He enlisted in the 4th New York Heavy Artillery on 2nd March 1864 in New York, and presumably received the wound which took his leg during the 1864 Overland Campaign or around Petersburg. He was discharged for disability on 26th January 1865 in Alexandria, Virginia. Private Michael Buird (also Bird), 161st New York Infantry- Co. Donegal? The unfortunate Michael Buird received $31.25 a month to assist him due to his disability, which was complete blindness. He collected this from ‘Ramerton’ (Ramelton?) Post Office. As a 23-year-old he had enlisted in the regiment at Dix to serve one year, mustering in as a Private of Company G in September 1864. The cause of his blindness remains a mystery- he was absent sick in hospital in Philadelphia, Pennsylvania when the Company mustered out. Richard Brooks received $4 a month at Waterford Post Office due to a wound received at one of the most famous battles of the war. Richard had enlisted as a 29-year-old in New York City on 7th July, 1861. While serving in Company C he fought with his regiment at the Battle of Fredericksburg on 13th December, 1862. He lost his right thumb during the action, and on 5th June 1864 he was transferred to the Veteran Reserve Corps. A variety of sources were utilised for these biographies including Civil War Pension Index Cards, Index to Pension Files 1861-1934 and rosters of various New York regiments. A full reference list will be included when the resources page is completed. interestingly,a lot of those that came back provided the next generation of immigrants.Michael and Richard Stack returned to Ardfert in Kerry. Michael bought a grocery store in Listowel Co Kerry. His son Michael jnr returned to the states in the early 1900s to become US Senator Michael J Stack. His grandson Michael J Stack III is a current state senator in Philadelphia. Many thanks for this- did Michael and Richard serve during the war? I would be really interested in finding out more about them if they did, as they would be good additions to the resource page on the veterans in Ireland! My Great Grandfather, Daniel Harty, lived in County Cork, Ireland. He was born there, lived there until he went to fight in the US Civil War and then returned to his home in Cork, Ireland. He never lived in the United States. According to family history passed down we have this information. According to family history, he was on the Confederate side. He was stationed in Spartanburg/Greenville, SC area. There is not one piece of information that I have found to document this only word of mouth. One of his daughters was my Grandmother. I have learned about the Confederate Agents in Cork, Ireland. They flew under the radar with England to work on the Confederate side. I know about Lieutenant JL Capston. Perhaps there were others doing the same thing that didn’t get caught. I wrote to the Confederate Library in Virginia. They told me there was not a list in Capston’s information of the men that he recruited. Do you have any knowledge of how a man would get from Cork, Ireland, to Spartanville, SC, and back to Ireland? Wouldn’t there be a passenger list? I have been looking into this for you and the only Daniel Harty I could find was in a Missouri Cavalry regiment, and it dosent seem to tally with him coming over from Cork- of course there is the possibility that a different spelling of his surname was used. It is not something I have come across before- also the agents like Capston were recruited specifically to prevent Union recruitment rather than to actively engage in recruitment themselves, but that is not to say there weren’t a number who went to fight with the Confederates. There are a number of Daniel Harty’s on passenger lists into places like New York before the war, I wonder is it possible he could be one of these? It will be very difficult to get much further without additional information on the man, e.g. birth and death date etc. but I am happy to have a look if that is available to see what we can find out!